The Eastern Bongo were once found in the highland forests of both Kenya & Uganda but now can only be found in Kenya. They inhabit the dense tropical rainforests of East Africa with thick, lush undergrowth that provide fresh, low-level vegetation. The Eastern Bongo is one of the largest antelopes, standing up to 1.3m at the shoulder and weighing 230 to 400kgs. The short, chestnut coat has 11 to 12 narrow, vertical stripes on the sides of the body, which help camouflage the animal. A short, erect mane runs from shoulders to rump and along the black, tuffed tail. The belly is black and a white chevron crosses the forehead, with other white patches on the head. The chest has a large white crescent and a dark dorsal stripe. A black chevron occurs above the white knees and a white patch is present above the hooves. Both sexes sport heavy horns that spiral one complete turn measuring up to 99cm in length. 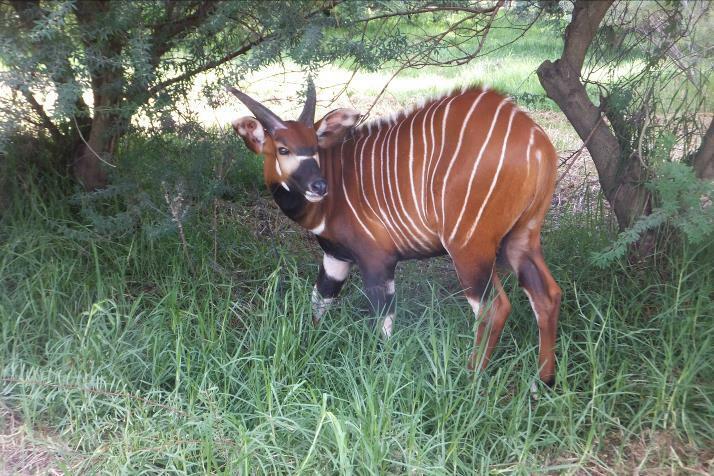 Bongo depend on hearing more than on sight, they are shy and swift and quickly disappear when startled. Both males & females have horns, the core of a Bongo’s horn is hollow and the outer layer is made of keratin, the same material that makes up human fingernails, toenails & hair. Bongo are nocturnal feeding mostly from dusk to early morning. Bongo produce a variety of different calls to communicate including; grunts, snorts, moos and bleating. They wallow in mud which they then rub onto a tree as a way of polishing their smooth and heavy horns. Diet: leaves, roots, bark, flowers, vines, grasses, fruits, shrubs and twigs. Reproduction: Mating tends to occur between October & January. Males & Females reach sexual maturity between 20-27 Months. Gestation period: 9 months to a single calf, rarely twins may be born. Group Structure: Males (Bulls) tend to be solitary, with females and young living in groups of up to 10 for safety and protection. Males will only meet with female groups for breeding season. Bongo are the only forest antelope to form herds. Predators: Leopards, Lions, Hyena and Humans. Young are occasionally eaten by pythons.